Those who swear fealty to Hel, the Mother of the Nine Worlds, become infused with the dual forces of life and death. The bodies of the HelBound bear the marks of their service, etched with the forces of Hel’s magic, which dwells within them. 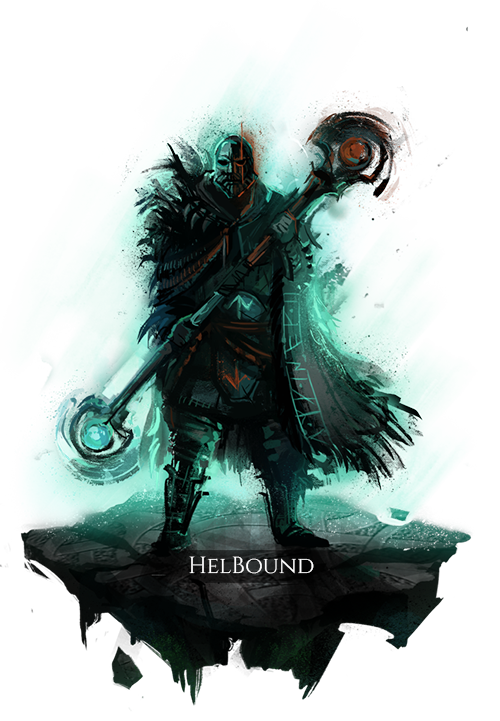 Often at the forefront of battle, a HelBound may find controlling their power a great challenge, for they can both heal and destroy. They can cure the mortal wounds of allies and wield fear as a weapon, frightening enemies to death. As for their own death, those who take Hel as their patron tend to recover quickly. Unless Hel has chosen something special for her fallen devotee. Life is to death as death is to life. When not wearing a Hel Mask, the user suffers greatly reduced life and death magic ability power. Use of Life abilities reduces Death Force, reducing the power of abilities using death runes. Use of death abilities reduces Life Force, reducing the power of abilities using life runes. Greatly reduces the power of panic-causing effects on the user. The user takes on an aspect of life, reducing all resistances and building Life Force over time. Life abilities additionally grant a Protection which reduces the damage taken by the target based on the amount of health they are missing. The user takes on an aspect of death, increasing all resistances and building Death Force over time. Death abilities additionally inflict a Vulnerability which increases the power of death abilities the target is affected by. The power of this Vulnerability increases each time the target is affected by a death ability, up to a maximum amount, over a moderate duration. Applies an Affliction which deals death damage to the target over time, and reduces their stamina and blood amount. Applies a Renewal which restores blood and stamina to the target over time. If using a life rune, this ability also applies its effect with reduced power to the user. If using a death rune, this ability also restores blood to the user based on the amount of blood loss inflicted. Deals damage to nearby enemies based on missing health, and heals nearby group members based on remaining blood. If the user has a Hel Mask equipped, removing the mask causes a large amount of panic to nearby enemies, and deals damage to them based on their resulting panic rating.